Brief Synopsis – A group of kids find a treasure map that they hope has the solution to stop their neighborhood from being bought out by developers. My Take on it – This is one of my favorite film from my childhood and I believe that I saw it at the perfect time in my life in order to fully appreciate it for the 32 years following. IMHO, this is one of the best films about the bonds of friendship among a group of kids and I always wished that my friends and I were as close as these characters seem to be. This film stays fun and entertaining the whole way through and it’s so enjoyable to watch and rewatch it all happen in front of us over and over. 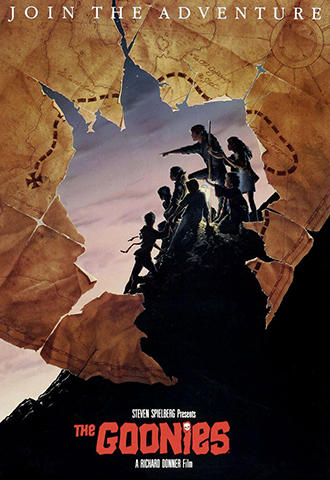 The cast is amazing and I love watching these kids (played by Sean Astin, Corey Feldman, Kerry Green, Jeff Cohen, Josh Brolin, Martha Plimpton and Jonathan Ke Quan) fend off against the Fratelli family (played by Anne Ramsey, Robert Davi and Joe Pantoliano). The script by Chris Columbus is written superbly and we get a story filled with lots of laughter, thrills, mystery, young love and lots of adventure. The music is an essential part of this film and it helps keep the pace of the film so thrilling. Steven Spielberg (Producer) and Richard Dinner (Director) did a wonderful job bringing these characters to life and the story is so much fun to watch unfold. Bottom Line – Excellent film about friendship that keeps things fun and entertaining the whole way through. The cast is superb and each of the kids went on to bigger and better things. Columbus wrote an amazing script and it is filled with laughter, thrills, mystery, young love and tons of adventure. Great music helps propel this film at a great pace. Spielberg and Donner did a wonderful job bringing these characters and their story to life. Highly Recommended!